The Stumptown Comics Fest was a blast…I got lots of great comics and introduced some new folks to my stuff as well. This time I had help at my table, thanks to the able and agreeable Kenny H., an old chum who offered to join me on the trip down from Seattle and who is a gifted drawing-maker in his own right – we’ll see if he gets bitten by the comics bug. I enjoyed cool new stuff by Corinne Mucha and Erika Moen, among others. 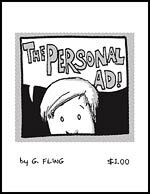 I returned home with a few extra copies of my print-on-demand books, so I’ve decided to put ‘em on sale – I’ve dropped the price a few bucks, and also getting them directly from me instead of from Lulu.com cuts the shipping down a bit too. Anyway, visit my comics store if you’re interested! The 2nd of two shows featuring your slacking comics pal Greg is coming up on Saturday, March 14th. 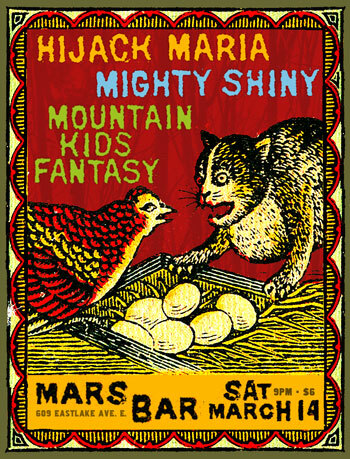 I’ll be playing in two of the three bands playing that night at the marsBar at 609 Eastlake Ave. E., in Seattle. Should be a swell time, as both of the bands are great. I can say that because I am not the frontperson for either. That way it’s not egotistical. Anyway, Mountain Kids Fantasy opens the night, with Malkah Duprix on guitar, me on drums, and then we’ll have a few guest musicians sit in and stir it up a bit. Mighty Shiny is up next, also with me on drums. The third band is Hijack Maria, which I am not a member of. The show starts at 9 (probably fairly sharp) and cover is $6. 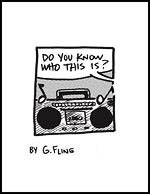 If you check it out and have been meaning to pick up some comics, I’ll have a few with me, so just ask…and we’ll also have copies of the Mighty Shiny CD. Whee! 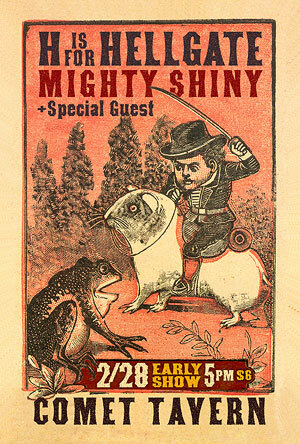 I play in Mighty Shiny and we have a show at the Comet Tavern in Seattle on Saturday, 2/28. It’s an early show and we go on right at 5:00, followed by a secret guest band and then H is for Hellgate. Come check it out if you’re around and your early Saturday evening is free. Also, old pal and occasional comicbook character Mike will be sitting in for a song! No new comics for awhile, I realize…I’ve been distracted by 1) music (two bands I’m in have a bunch of gigs coming up – visit mightyshiny.net and mountainkidsfantasy.com for the details); and 2) laying out and printing Flung #4 and Smaller #1 (unless I change my mind on the name) in time for the Stumptown Comics Fest. So: more blog comics coming shortly, and other doings doing also! 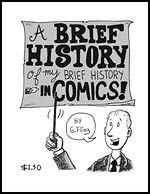 Come see me at the Olympia Comics Fest! 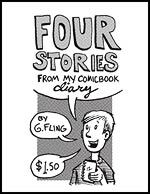 I will be tabling at the Olympia Comics Fest on Saturday, June 7th! It looks like it’ll be fun – come by and say HI if you’re in the area! I’ll have minis, books and more at my table. Plus there’s, well, me! It runs from noon – 5 at The Vault, in downtown Olympia – here’s a map, and more info is on the fest site. Hope to see you there! Later in the summer I’ll be at the Portland Zine Symposium, which is the weekend of August 23/24 at Portland State University. 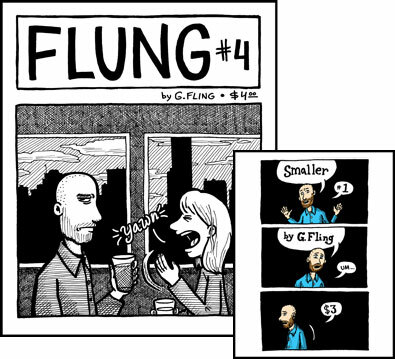 If all goes according to plan I’ll have a new issue of Flung debuting as well, sort of a follow-up to #3 and the Personal Ad dates stories. Hi, all! I’ll have a table at the Stumptown Comics Fest this weekend! This is my first time at a show since I got back into comics so I’m really looking forward to the experience and checking out what everybody’s got. I’ll have a bunch of stuff with me, including four new (and cheap) minis – covers below. Come by and say hi if you’re going – I’ll be at table 48!